While little is know about architect Benjamin Hartsuck, records indicate that he holds the distinction of establishing the City of Olympia’s first real architectural firm. Reportedly Hartsuck was born in Ohio in 1831. Although he was born in the north, he was living in the south during the early stages of Civil War and was drafted into the Confederate Army against his will. 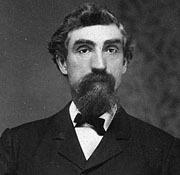 While his formal architectural training and professional background is unknown, reports note that Hartsuck arrived in Olympia around 1887 after spending time in Texas and Iowa. Hartsuck’s training, whatever it may have been, was widely respected in the local community and he was hired numerous times to help in disputes between builders and property owners. Such projects included being hired to examine the fire escapes at the Olympia Theater, where he deemed them “Safe and Sufficient” (1893). He was also hired to look at City Hall regarding safety of the building, reporting that while “the sills were affected with dry rot, the piers were in good condition” (1898). The earliest records noting Hartsuck’s design work in Olympia revolves around the Mann Building (1889). Hartstuck testified at a State Supreme Court Case revolving the denial of a permit to construct a building which did not meet local ordinance specifications. County Treasurer, C.B. Mann had submitted plans to erect a 2-story frame office and store building on the corner of 4th & Main, but the city denied the permit stating that it did not meet the fire code which required buildings of brick and stone. Around 1890, Hartsuck formed a short-lived partnership with J.W. White. Directories indicate that the firm practiced in Port Townsend as early as 1890, but they returned to Olympia by 1892. Perhaps bringing them back to Olympia was the Thurston County Courthouse project (1892). Reportedly Hartsuck was appointed the supervising architect/contractor for the courthouse, designed by W.A. Ritchie. Other known projects by the firm is limited to the Westside School / Garfield School (1893), which is often confused with two other schools (Lincoln & Washington, designed by Richie) built at the same time. The Romanesque Revival Garfield School has a simpler roof form and exterior detailing than the Richie designed buildings. In 1903 Hartsuck was also involved in a dispute over a defect in the new county jail he had designed. Newspapers reported that the jail had a decorative tissue paper ceilings, hinges on doors inside the cells, no bars on upper windows, and a stove/flue could which could be removed, all of which attributed to a cell that was easily escapable. In his defense, Hartsuck claimed the walls were tall enough so that the prisoners could not reach the ceiling, and that a body could not fit through the stove flue. Despite his lack of known projects, at the time of his death, newspapers noted that he designed “a number of the best buildings in the city”. Hartsuck died March 18, 1905 and is buried in Masonic Memorial Park in Tumwater. White continued a practice in Spokane. “Three Minutes Work to Break Jail From New “Skookum House”” – Morning Olympian, February 7, 1903. “B.F. Hartsuck Dies of Heart Failure” – Olympia Daily Record, March 20, 1905. “Brevities” – Morning Olympian, August 20, 1893. “Levy for 1899 Will be 7 Mills” – Morning Olympian, October 25, 1899. Obituary - “Mrs. Lovina K. Hartsuck” – Oregonian, April 14, 1922. “Pioneer Architect: B.F. Hartsuck Succumbs After a Long Illness” – Morning Olympian, March 19, 1905. “Mrs. L.K. Hartsuck, Chaplain of Eastern Star, Dies Suddenly” – Morning Olympian, April 12, 1922. “Funeral Services for Mrs. Lovina K. Hartsuck…..” – Olympia Daily Record, April 22, 1922. Advertisement - “Hartsuck & White - Architects” – Morning Olympian, September 9, 1892. “Mr. B.F. Hartsuck, one of Olympia’s most prominent architects…..” – The Shelton Sentinel, August 6, 1892. “Work Will Continue: The Money on Hand for Westside School House” – Morning Olympian, September 2, 1893. “High School Building: The Plans of Architect Weeks Adopted by the School Board” – Morning Olympian, March 26, 1892.